In and Out Grand Opening in RIALTO!!!!!! RIALTO FINALLY HAS A IN & OUT!!!!!!!!!!!!!!!!!!!!!!!! Yes the long awaited fast food chains expansion has moved into RIALTO and not a moment too soon. At the August 27th Council Meeting Councilman Joe Baca Jr said that people in Rialto were looking for more food options and a way to enjoy one of the most popular Hamburger Restaurants on the West Coast. Rialto City Administrator Mike Story said that their announcement of the Grand Opening received 50,000 hits on the City of Rialto Facebook page. 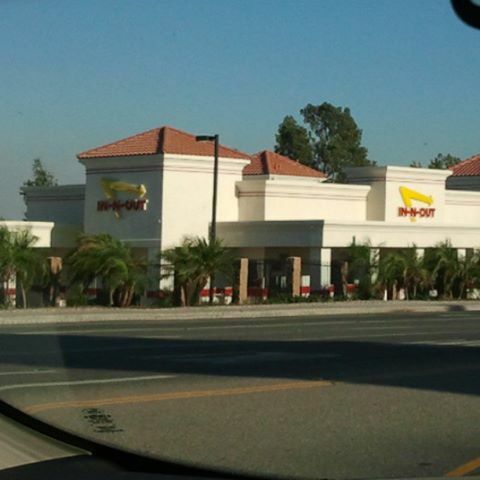 In-N-Out Burger expects to open its Rialto store on Riverside Avenue, just south of the 210 Freeway around Labor Day. Construction crews are busy finishing the building improvements with fixtures and equipment soon to follow. The City approved a memorandum of understanding with an exclusive developer of Chipotle stores to locate adjacent to In-N-Out Burger on a 30,000+ square foot pad. The developer intends to construct a 4,500 square foot retail module that will accommodate Chipotle and one other retail or restaurant tenant. The terms of the transaction must now be developed in a purchase and sale agreement and submitted to the City Council for consideration. Because all of the site improvements and utilities have already been installed, construction can be completed in 90 days or less once started. This has been long awaited opening and I’m sure Thursday will be a busy, busy day. This In & Out sits where the Old Fire Station used to be which is now located just south on Riverside Ave. If you are out there during the Grand Opening please take pictures and tag the Rialto Now in your social media posts.